The walls of your home say much more than you think. They can alter and transform any living space with the help of a little colour and some design elements. An extraordinary room can instantly be made quieter and calmer with the application of light pale paint colour, while a room that feels way too large can instantly feel more relaxed with the addition of a darker wallpaper with a pattern. 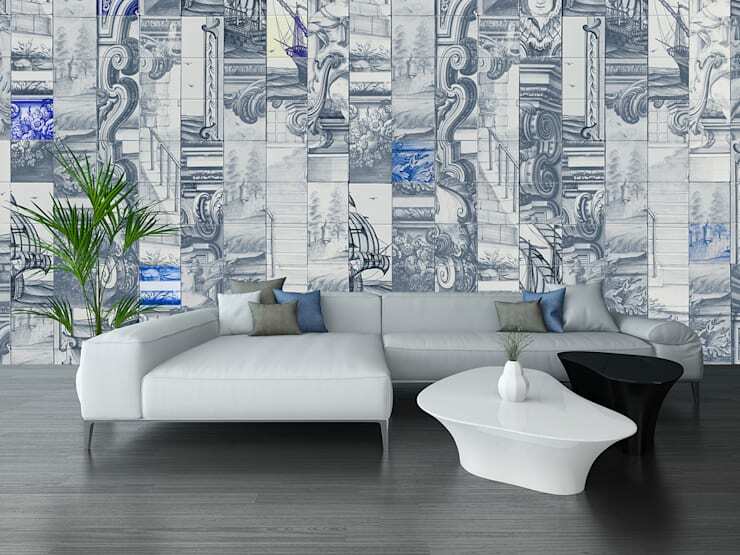 Nowadays, wallpaper is making quite a comeback, as its versatility and effortlessness of use are once again recognized. So, given every type of wallpaper out there, which one is the right one for me and my home? What are the benefits, and how do I apply and maintain it? And what if I want to remove it? Well, this Ideabook was designed just for you. Here are a few tips on how to handle and implement wallpaper in the most intimate room in the house – your bedroom. What are the benefits of wallpaper? 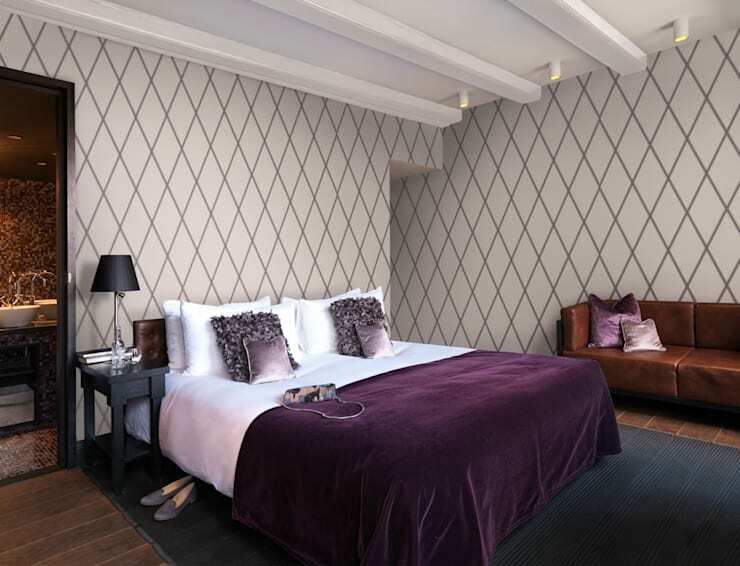 There are quite a few benefits to using wallpaper over using paint in your bedroom. Perhaps the most notable benefit is the huge variety of decorating options available to you. With wallpaper, you can choose from hundreds, even thousands of motifs, colours, and styles. Some wallpaper can even be painted, which will allow you to add a bit of texture to your bedroom while still being able to utilize your favourite paint colour. You can even vary the way the wallpaper is placed. For example, some bedrooms look fantastic with a simple wallpaper border, while others look best when the wallpaper covers the walls entirely. Wallpaper is also very easy to clean. Most wallpapers are coated with a special material so you can wipe them clean from everyday dust and markings. This means the wallpaper in your bedroom is more durable than some paints. Paint fades with each wash, so wallpaper is perfect for you if your walls get dirty easily. The patterns in the wallpaper themselves also help to hide any smudges, and it hides imperfections in the wall’s plaster much better than paint. What about patterns and styles? Wallpaper becomes an extension of your personality when you apply it. So really think about which pattern or style you want to use before you buy. To start, think about the overall theme of your bedroom. Is it a calmer environment? Maybe with cool-coloured textiles? Then we suggest coral, aqua blue, lilac, or mint green wallpaper patterns to keep that tranquil vibe going. You could also choose neutral coloured patterns, or better yet, solids. But maybe you’re looking for something a little louder and more spirited, like we see in this image. The flower print wallpaper in this bedroom matches perfectly with the beige bed covering, making a serene room pop with life. 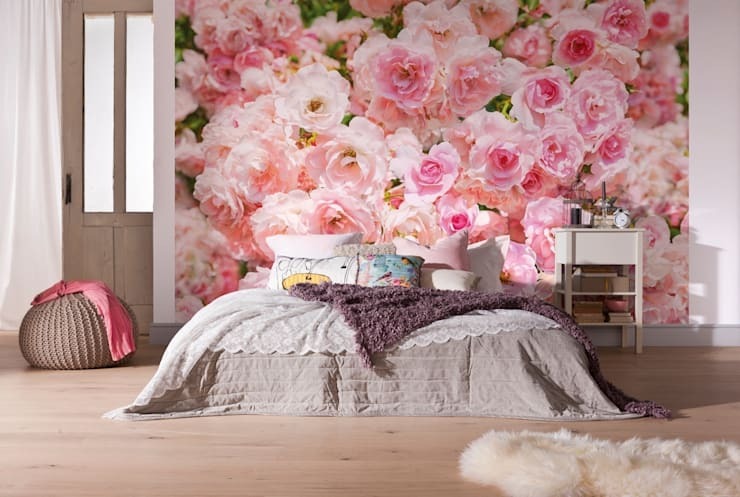 There’s a huge market for flower print wallpaper, offering you everything you could ever want – from subtle pink blossoms to bright roses in full bloom. Of course, patterns don’t just stop at what we've mentioned here – you can choose from striped, spotted, paisley, victorian, modern, eclectic… your choices are endless! How do you choose the perfect wallpaper? There are many different types of wallpapers on the market. There are standard papers that are cheap and easy to put up, and there are vinyl-coated papers that have sealed surfaces with a liquid vinyl, which is what makes it washable. And then there's solid sheet vinyl, which consists of vinyl bound to a cloth or paper backing. These wall covers are the most rugged and stain resistant, so you might want to consider this type of wallpaper for the kitchen. 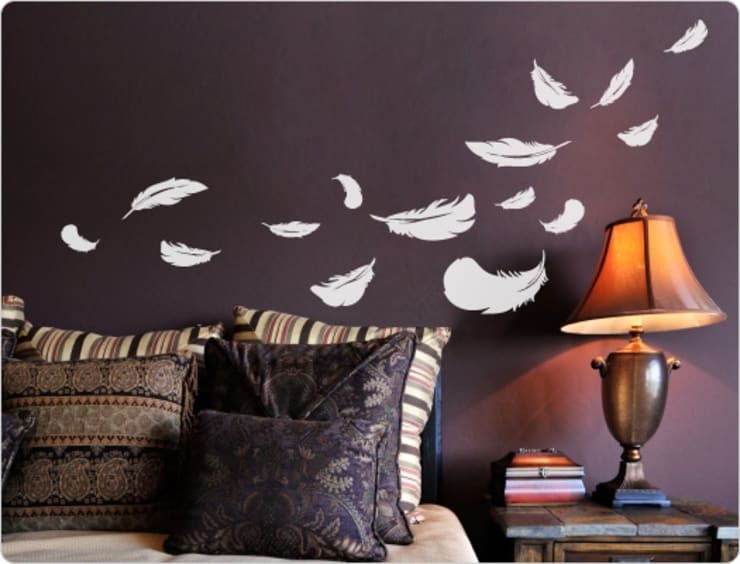 For first-time wallpaperers, better use vinyls. They’re not only the easiest type of wallpaper to put up, but they’re also easy to live with, as they’re durable, resistant to dirt, and easy to clean and even remove. Foils and Mylars are great for small rooms that have little natural light. With this type, though, you should be cautious. The surface of your walls has to be in pretty perfect condition, because the paper’s shiny surface will highlight any flaws once you apply it. On the other hand, you can opt for flocked wallpaper, which has raised, velvety patterns and is good for covering walls that have those few scrapes and bumps. Washable flocks are easier to install than non-washables, but both are expensive, and installation generally requires a professional. Now the part you've been waiting for. How to apply it! You can easily hang your beautiful new wallpaper by following these steps. First, wipe down the walls with warm water and let them dry thoroughly. Apply a primer with a roller to help the wallpaper stick and let it dry for at least two hours before hanging. Start by drawing a guideline on the wall. Use a straight edge and a level to make sure the line is exact. Next, measure and cut the paper, leaving a few extra inches at the top. Spread the paper out on a flat surface and apply adhesive. Use a figure-eight motion to spread adhesive evenly over surface of paper. Carry the wallpaper to the wall and stick it up, aligning the paper with the guideline you drew earlier, while leaving a couple of extra inches at the top and bottom. Smooth the wallpaper using the smoothing brush and trim away excess using a utility knife. Repeat this process until all walls are covered and voila! 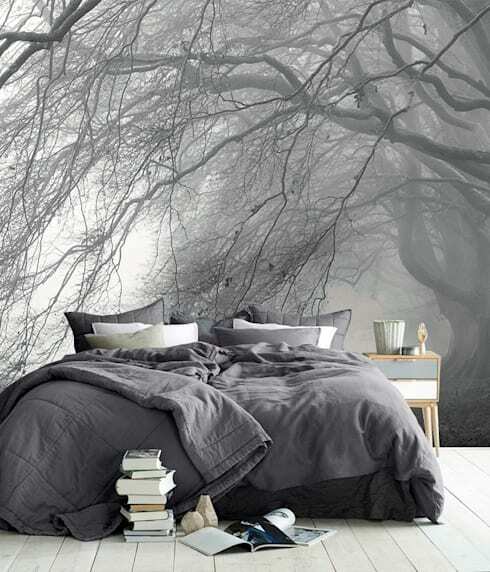 Your bedroom now has a beautiful wallpaper that reflects your personal style. How do you maintain wallpaper? Sadly, wallpaper doesn't last forever. Knowing how to properly care for and maintain your wallpaper is key, so you can delay deterioration. Your wallpaper cleaning method depends entirely on the type of material the wallpaper is made out of. Cleaning instructions and durability information is on every roll of paper you buy, so read that first. But we still have a few general suggestions to help you maintain your new wallpaper. Dust your wallpaper first to remove all dirt and debris. Then, check your wallpaper’s durability by cleaning a small area. Always wipe with the seams, so up and down, rather than from side to side, and always start from the bottom of the wall and work up to avoid drips and streaks on the paper below. We recommend you finish one section at a time, cleaning and drying each area before moving to the next. Now for the removal process. The process will be much easier with the right equipment and the right approach. Follow these steps, and you’ll have that wallpaper down in no time. Before you start, lay down drop cloths over carpet and anything else you want to protect. Move any furniture you want out of the room, as it will make the process easier. Then you want to determine what kind of wallpaper you have. If the whole thing peels away in one piece, you have easy removable wallpaper. If you can’t peel your wallpaper away from your wall by hand, then you have traditional wallpaper and you’ll have to remove it either with stripping solution or a wallpaper steamer. If you do have traditional wallpaper, before you start removing, score the wallpaper on your wall. Putting holes in the paper will help your stripping solution to penetrate the adhesive. Next, fill a bucket with hot water and mix in a wallpaper-stripping solution according to the instructions on the bottle. A vinegar solution would also be an effective, cheap, and non-toxic way to get rid of wallpaper. Then, soak a paint roller in the stripping solution and saturate one section at a time. Let it soak, and then strip away. Wash away the residue with soap and hot water, rinse, and then dry with a clean towel and you’re finally done! Now that you've read this Ideabook, are you ready to apply your own wallpaper to your bedroom? Let us know below!